Hey everyone! I know I'm pretty far behind on content. It may seem like I've been doing much, but I've been actually been doing a lot of work on the site that I'm excited to tell you about! I mentioned in my last post, I did a major overhaul of the site's backend. Well, that overhaul enabled me to make the improvements that I'm going to tell you about now. Now, I still want to improve the presentation of that data, but in the meantime it should still get you to what you're looking for faster. I felt that I couldn't have the community to contribute content to this site's database without making the database openly available the community. So, I've made the database accessible programmatically via a JSON API. The Starfinder content can be found at https://starfinder.dragonlash.com/api/, and the APIs for other gaming systems will be found under their respective subdomains as they're added. With this, developers can easily retrieve information from the database in their applications. So contributing updates to this site also means contributing to all the websites, apps, and tools that use this API as a data source. Have you ever got stuck so far in the mud that you were better off just gunning it and trying to make it to the other side? Yea, that was pretty much where I was with this website over the last month. For several months I had been working on a major overhaul of the website's backend and managed to make some changes to the database that weren't backwards compatible with the live site, and that I wasn't able to back out. So even though the update wasn't fully ready, I had no choice but to just go all-in. So, you may have noticed things were pretty rough on the site for the past few weeks. A lot of it was the fact that my update reorganized the site urls, but I didn't have a way to easily redirect the thousands of pages that this site has. I was able to write some regex rules to redirect the major pages to the new locations, but a lot of them just returned "404 Not Found" errors until Google delisted them. At this point, Google has finally updated their indexes, so you shouldn't be seeing any more of those bad links. Sometimes things need to get worse before they get better, and now with this overhaul things are better than before with a whole lot of improvements to tell you about. Sidebar Nav: Subpages can now be expanded without first visiting the parent page. The current page is highlighted and expanded. On smartphones the nav slides in on the left side of the screen using the hamburger menu in the upper right. Table of Contents Nav: The sidebar nav was working so good, I decided to use it for the table of contents too! Here the links all smooth-scroll to anchor tags on the page. Darkmode theme: If you're browsing in a dark room, or if you just prefer light text on a dark background, look on the bar on the bottom of the page for the "toggle theme" option. Backend CMS: I've had people offer to help with aspects of the site's content, but for non-programmers, dealing directly with a database is a difficult thing. This content management system (CMS) allows anyone, even non-programmers, to log into the website and edit pages or add items, abilites, spells, etc. to the database directly through an easy-to-use website interface. Exit SQLite + Elasticsearch, enter PostgreSQL: I've been using ElasticSearch, which is very powerful, but was sort of awkwardly bolted onto the project. Over the last year or two, PostgreSQL has added some incredibly powerful full text search capabilities. I'll be able to do this in a much simpler way with PostgreSQL, plus it has some "NoSQL" capabilities which I was thinking might be useful in some cases (like for starships, or when I add character sheets). The PostgreSQL search is still a work in progress, what's on the site now is a very basic search, so stay tuned for improvements here. I'm pretty psyched for this update. 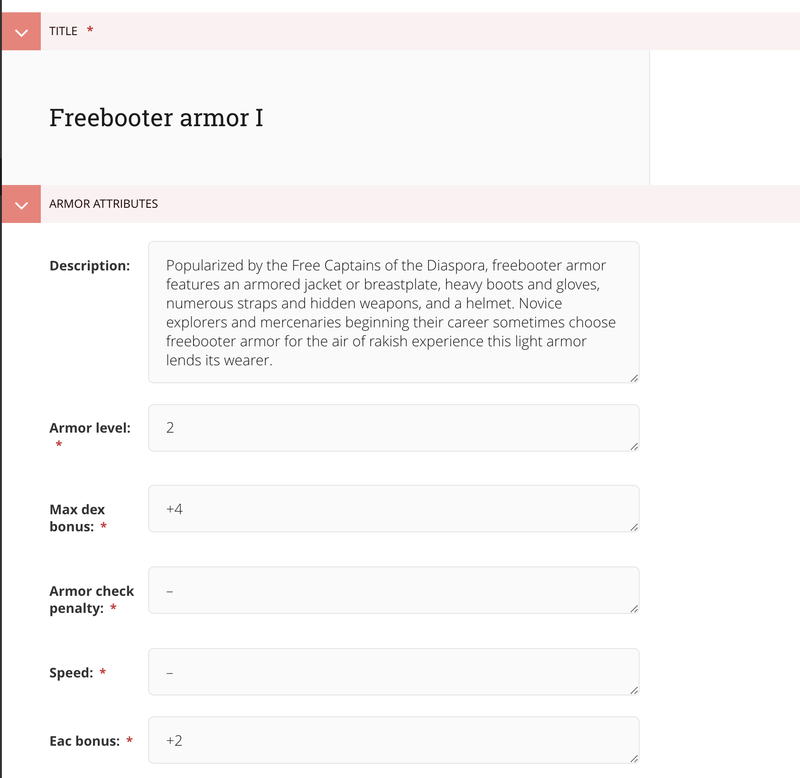 Finished adding in rules content, still more to go. Progress made on the game mastering section, still more to come. Added top-nav bread crumb. Now if you find the site from a google search result, you can still see where you are. The side-nav is still kind of a beast for now. Images: In case you're wondering why the site is a bit minimalist, it's to keep loading speeds quick and pages streamlined so you can find what you're looking for easier. Tables: I’m psyched about translating the tables from PDF format to a condensed, searchable, mobile-optimized view. That page is still giant, but the Search function is there to mitigate that. Follow the new DragonLash Facebook page for updates! Join the DragonLash Facebook Group to discuss Starfinder, Pathfinder, DragonLash, whathaveyou. +1 Charisma: My cool af little sister has joined the DragonLash ranks. She knows *almost* nothing about Starfinder and Pathfinder, but grew up around Dungeons & Dragons and is psyched to learn these games. Plus she knows a metric shitton more about building a community than I do. Questions/comments, click here to get in touch. One of the things that I absolutely love about the Pathfinder and Starfinder roleplaying games is the enormous number of choices when it comes to customizing a character. I've spent many hours tweaking my characters and hunting for the perfect combination of feats, skills, weapons, and whatever else before diving into the next dungeon. I created this site to make finding that information easier. Mobile-Friendly: Dragonlash is mobile-friendly, adapting to your iPhone, Android, or tablet screen to make the most efficient use of space –improving readability and navigation, no pinching or zooming required. More: In short, I'm excited about the site thus far but it's still a work in progress. Let me know what you think so far: To give feedback/suggestions and/or sign up for updates, click here.